Strange that our HUMAN SYNTHESIS ´Blogger´ blog, with a monthly average 1.500 visits, or 50 visits daily, is now showing only 4 visits yesterday and 3 visits today??? Have the global elite´s media started blocking their "Fake News" already? Yes,they are definitely blocking this blog now. OK, there´s only one thing to do. Change to another blog without Google influence. Bloody cowards !! We are heading for uncertain times if the globalist media are allowed to ´turn tables´ on the concept of "Fake News" invented by themselves during (and before) the presidential election in the US. Now being used as a term for independent media who are not considered ´politically correct´. Google has been caught actively moving traffic away from websites of the Independent Media. Google routinely denies Independent Media sites, such as The Common Sense Show, from participating in the Google Adsense advertising program. 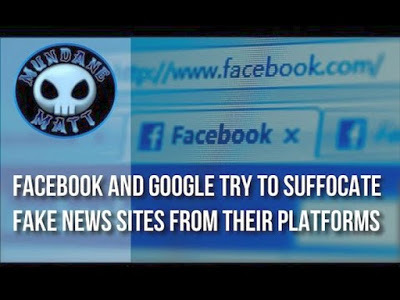 GOOGLE IS PREVENTING THE PUBLIC FROM REACHING NEWS WEBSITES THAT DO NOT CATER TO THE GLOBAL ELITE. GOOGLE NEEDS TO BE BOYCOTTED. Dave Hodges interviewed Mike Adams on this issue. Mike has developed an alternative search engine called, goodgopher.com. Simply type the URL in and bypass Google’s NSA sponsored censorship. Then there is the HTM compatible Ghost Blogger you are reading now. And the slandering and bad-mouthing of President Trump continues through a press and TV commanded by the global elite. Unlimited funds are spent causing world-wide demonstrations of a great variety against Trump as a person and a president. Unsuspecting people are brainwashed to stand against Trump and any action he takes as promised the electorate during the election campaign. The very nature of their actions, and lack of respect for a newly elected US President strips their masks and reveals their evil faces. A history of George Soros and his fellow globalist elite creating chaos in the world.